This course and trip explores the central European region where traditionally Eastern and Western European cultures have intersected. The nations on our itinerary have long histories that range from Roman occupation to being part of the Soviet block in the Cold War. Pula, for example, has one of the best-preserved Roman amphitheaters in the world and Cesky Krumlov is listed as a UNESCO World Heritage site with historic buildings, gardens, and a medieval castle complex. With the end of Soviet dominance in the 1990s, these countries have opened up to visitors, though their treasures are often overlooked as tourists visit western Europe in much larger numbers. This region is peppered with castles, Roman ruins, modern cities, and villages little changed over the centuries. 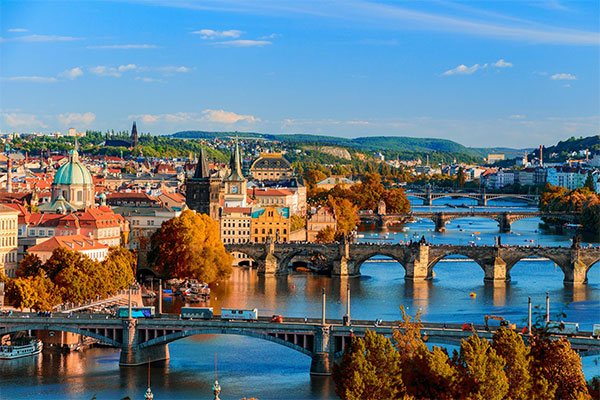 We will begin our trip in Prague, which is considered one of the most beautiful cities in the world and nicknamed the City of a Hundred Spires. After Prague, we will visit more of the Czech Republic, Austria, Slovakia, Slovenia, Croatia and part of northern Italy. Cities on our itinerary include larger cities like Prague, Salzburg, Vienna, and Bratislava, and smaller towns such as Cesky Krumlov and Pula. We will finish the tour portion of the course in Venice, which is built on 118 small islands connected by 400 bridges. The "City of Water" was historically a major trading center, a major cultural influence, and a unique engineering feat. Many include Prague among the world’s most beautiful cities. Sites such as Prague Castle, the Charles Bridge, the Old Town Square, and St. Vitus Cathedral go back many centuries. More recent areas include the Jewish Quarter and sites related to World War II and the 1968 Soviet invasion. This small town preserves much of the terrain of the Middle Ages, with the central Cesky Krumlov Castle and many museums, churches, and even a graphite mine. This historic city was the center of the Holy Roman Empire for centuries, and important sites include the imperial Hofburg Palace, the Schönbrunn Palace, and St. Stephen’s Cathedral. Museums of famous residents include Beethoven and Freud. Possible day trips include the Slovakian capital of Bratislava and nearby border towns of Hungary. This city on the coast of the Adriatic Sea has remarkable Roman ruins from the days of the Empire, including one of the best preserved amphitheaters from those times. Pula provides an opportunity to sample the many beaches of Croatia. The famous canals of Venice offer a centuries-old setting for this picturesque Italian city. In addition to exploring the canals, museums, and churches of Venice, possible daytrips include nearby cities such as Verona, Trieste, and Bologna.